I have been working for Sealasash for a few years now, and in that time I have replaced countless window sills, done my fair share of scarf joints, and have replaced hundreds of window rails and stiles. In working with timber windows that are sometimes hundreds of years old, I’ve learned to expect that I may uncover unwanted surprises. Even if we didn’t expect them, it makes sense that we take care to fix these problems properly as they arise. I see my role as split between draught-sealing the clients windows, and protecting and insuring the longevity of the window. I cannot count the number of times I have uncovered a rotten patch that has been filled with acrylic gap filler, silicone, builders bog, and surprisingly even plaster. These materials look great when they are sanded and painted over. However at the end of the day these kinds of ‘repairs’ don’t fix the problem at all, they actually make it worse. Some repairs look great on top, but just mask the problem. Until you cut into the timber, you can’t always see what’s happening. 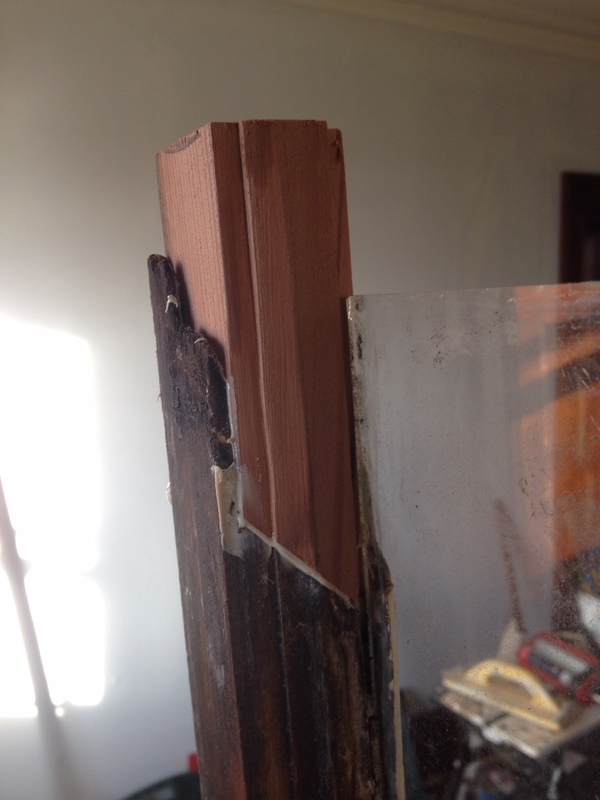 This is the same piece of sill, shown from above, and with the old repairs stripped off the top. People don’t always deal with the problem of rot fully and completely. There are two common reasons for this. First, it’s a lot more work to do the job properly. Second, even someone with a lot of experience can be fooled by old repairs, and can underestimate the work required at the start. If you are using a contractor and they provide a fixed-price quote, they are likely to take a shortcut if they discover an unexpected repair half way through the job. That’s why we charge some types of rot repairs on an hourly rate – your contractor needs to know from the start that your priority is to get the job done right. 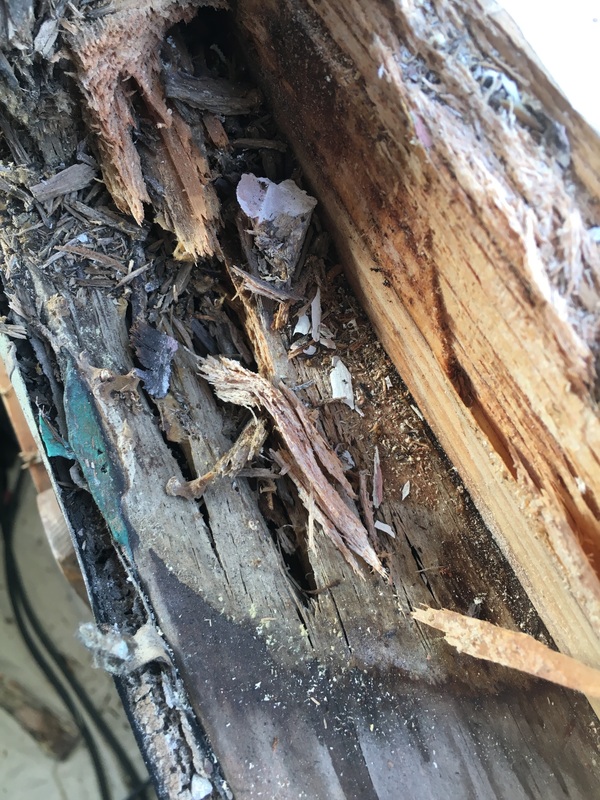 Rot is a fungal infection of timber. In rare cases, the infection can spread into the surrounding wall framing. 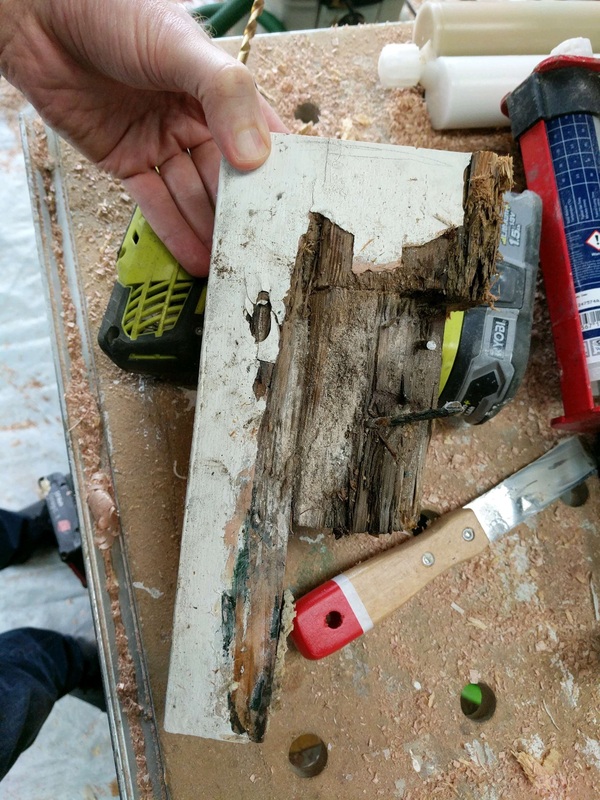 This shows a wall frame under a sill that was removed. 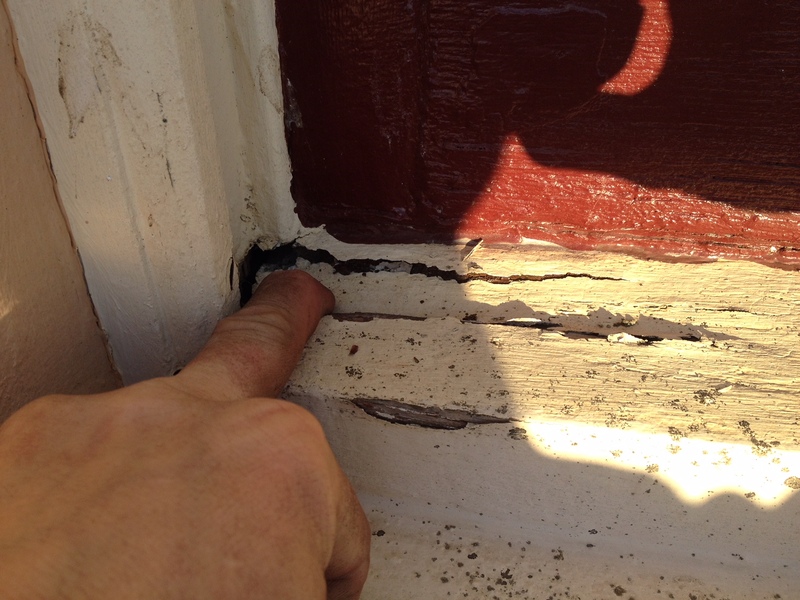 This customer wanted to reduce the uncertainty in her quote, so she scraped out all the rot before we arrived to quote. This is a good way to see exactly what the problems are. Here a window stile has been repaired in accordance with the conservation principles in the Burra Charter – doing as much as necessary, and as little as possible. When you are looking to fix a rotten component of your window there are a few things to have in mind. Firstly, How much rot is there? For myself I typically make a few cuts, or large bore holes to identify how far it has spread. From this I can then determine whether we need to replace an entire component (e.g. 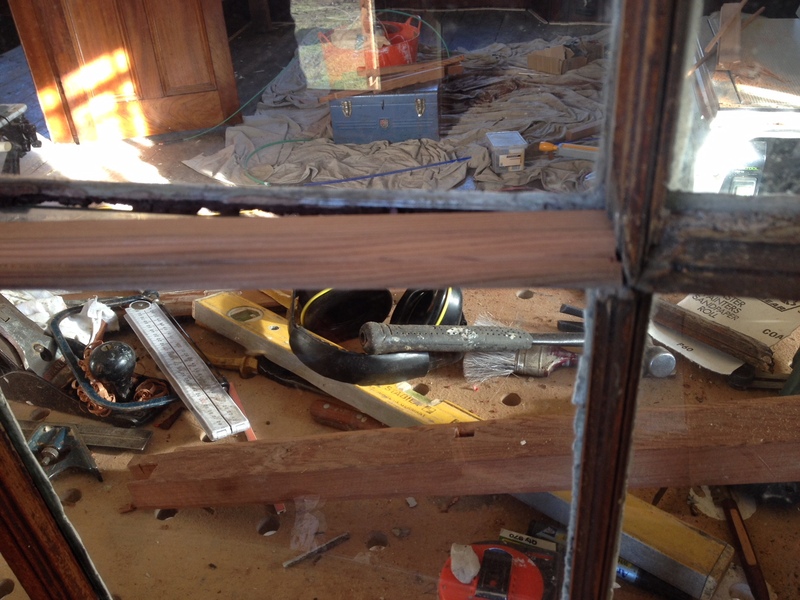 a sill) or if we can remove the rotten section and install a jointed piece of timber. Often you will need to do a combination of these in one window. The next thing you need to do is remove all the rot in a manner that will allow for a clean joint for the new parts. To allow for this the best tool to use is a multitool. A multitool allows for technical and obscure cuts to be made relatively simply and swiftly. 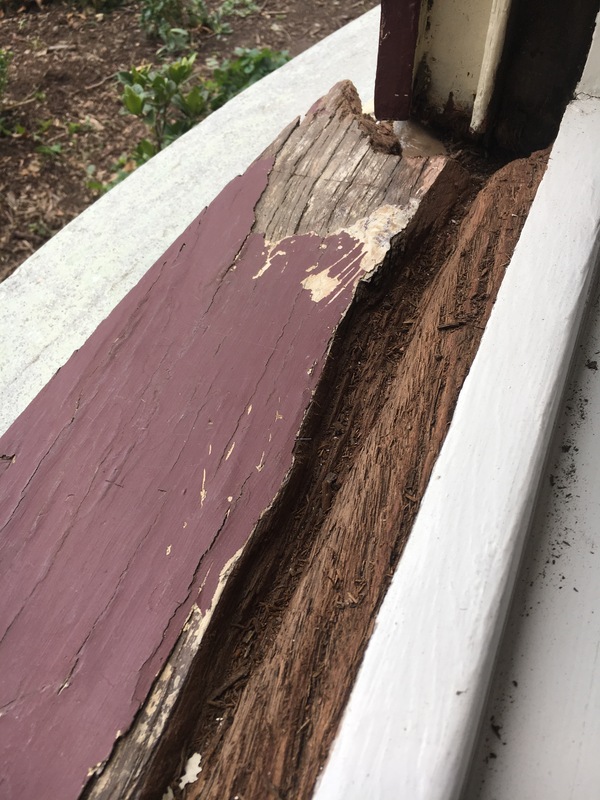 Once removed, any sections of the windows that were compromised with rot need to be treated with a two-part timber treatment preservative. This preservative works by soaking into the timber grain and crystallising, making the timber resistant to movement and further rot. It also works to isolate and capture any small portions of rot that may have been missed when you cut out the rest of the rot. Some rot is immediately obvious to the touch. 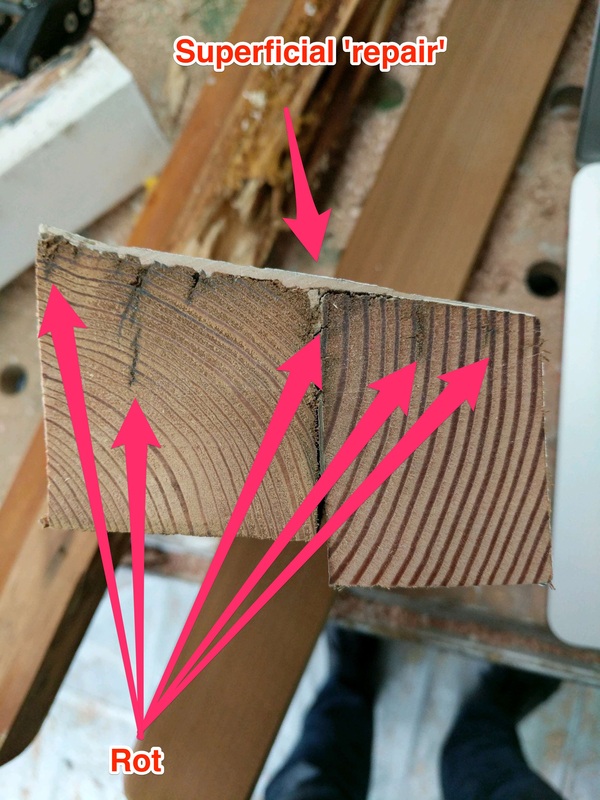 In other cases, you need to cut a cross section of timber or drill a large pilot hole to figure out how far it goes. Any part of a window can be replaced. In this case a single part of one glazing bar has been replaced. This type of work is not economical in most residential projects, but is suitable for heritage-listed sites. Finally you begin to rebuild your window. For this you will want access to a table saw, drop saw, multitool again, and potential a router. As you are cutting each component to put back in place it is important to try and mimic as much of the original joinery as possible. In my opinion, the mortice and tenon joints that are used in sash windows for example, have outlasted many modern fixings and fastenings, so why wouldn’t you want to replicate this! I do make some exceptions to this of course. For example, again when I am finishing a mortice and tenon joint, I use a special two-part epoxy. I have found this glue far more workable and forgiving than any of the shelf. Once all the glue is dry, sand down through your grits. Start at about 80P and work down to about 120P. You may need to shape your corners with a chisel to get clean and crisp joins and to return those decorative mouldings. Finally cover all surfaces with a primer sealer to protect the timber and to prevent any rot penetrating in again.